With its colourful swirls and bands, it really does look otherworldly. The stunning NASA image of Jupiter reveals the gigantic 'cloud belts' across its surface in unprecedented detail. It shows the full extent of the different weather systems on the gas giant, where vasts swirling cloud formations travel at about 129,000 mph (60 km/s) over the gas giant planet's surface. 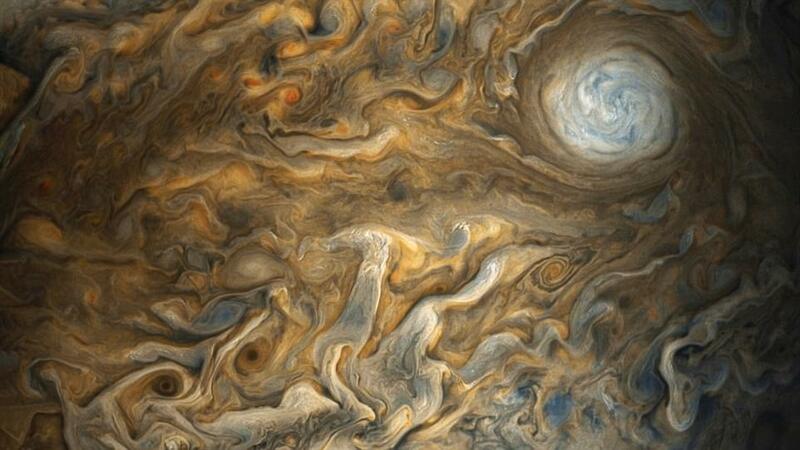 'Jupiter appears in the color-enhanced image as a tapestry of vibrant cloud bands and storms,' NASA said. The dark region in the far left is called the South Temperate Belt. Intersecting the belt is a ghost-like feature of slithering white clouds. This is the largest feature in Jupiter’s low latitudes that’s a cyclone (rotating with clockwise motion). Kevin M. Gill processed this image using data from the JunoCam imager, which NASA posts online to let amateur astronomers process. 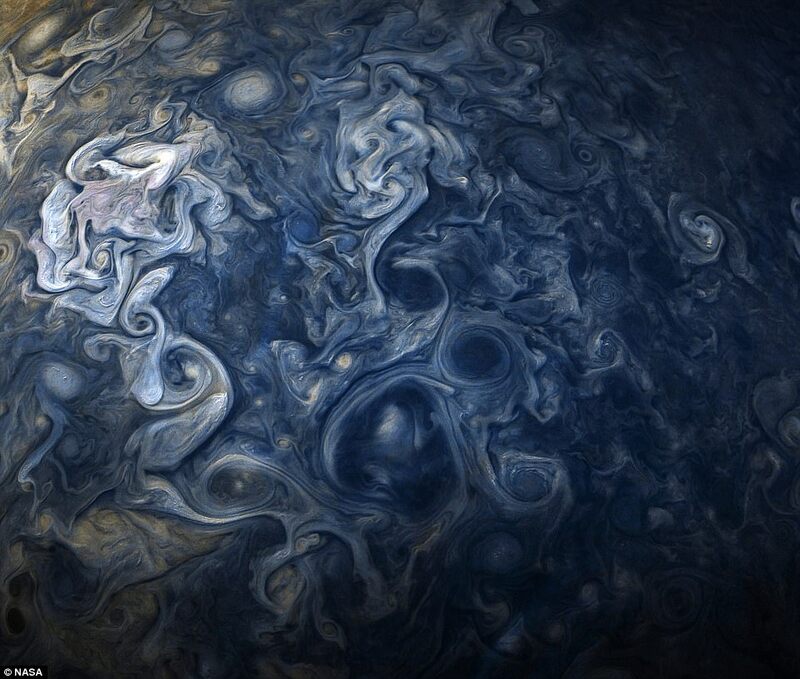 Just last week a stunning new Nasa image showed raging storms on Jupiter with clouds that stretch for thousands of miles - and it looks just like an oil painting. 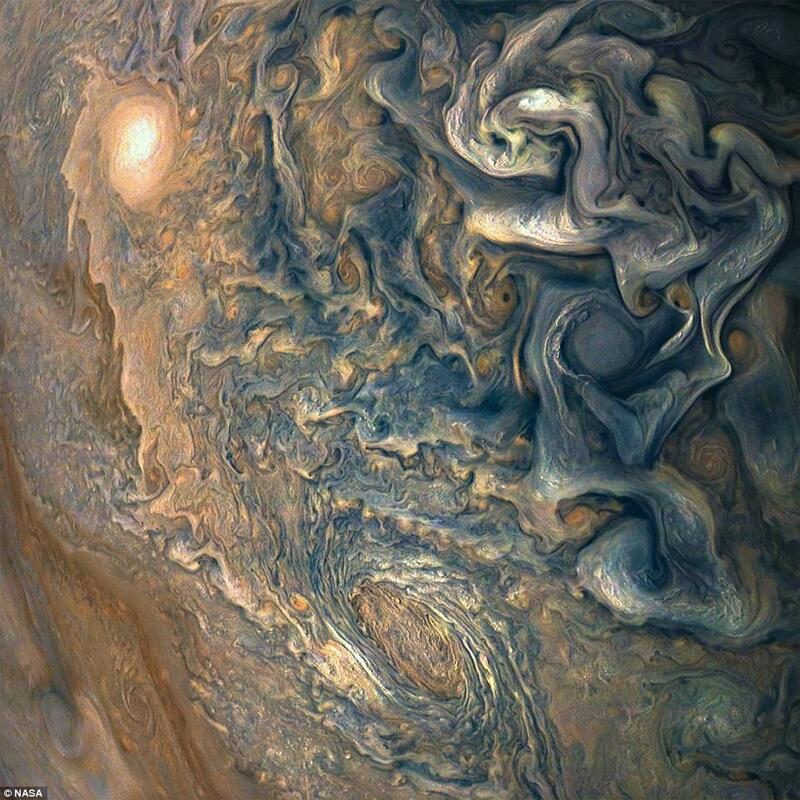 Nasa's Juno spacecraft was a little more than one Earth diameter from Jupiter - or 8,292 miles (13,345 kilometres) - when it captured this mind-bending view of the planet's tumultuous atmosphere. The incredible colour-enhanced image was captured at a latitude of 48.9 degrees and depicts vasts swirling cloud formations that travel at about 129,000 mph (60 km/s) over the gas giant planet's surface. The spacecraft, which has been orbiting the planet since 2016, took the image during a flyby on 16th December 2017 at 9:43 a.m. PST (12:43 p.m. EST). 'Jupiter completely fills the image, with only a hint of the terminator (where daylight fades to night) in the upper right corner, and no visible limb (the curved edge of the planet)', a Nasa spokesperson said. Citizen scientists Gerald Eichstädt and Seán Doran processed this image using data from the JunoCam images. 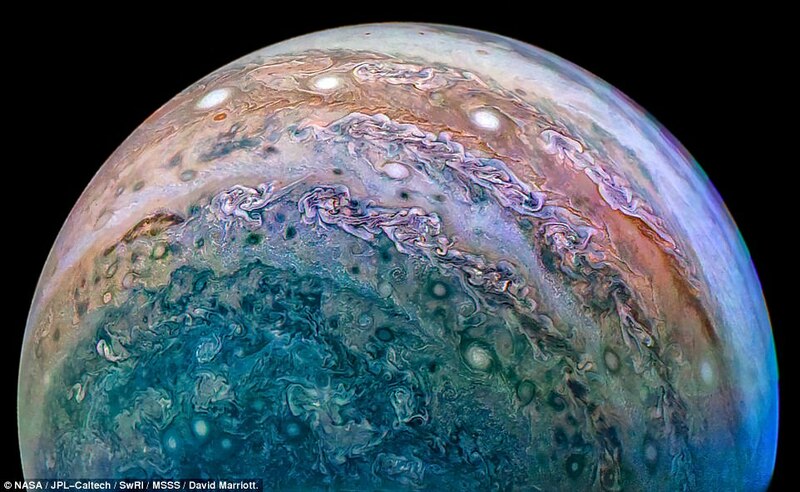 The space agency also released additional images showing the view from high above Jupiter's clouds. 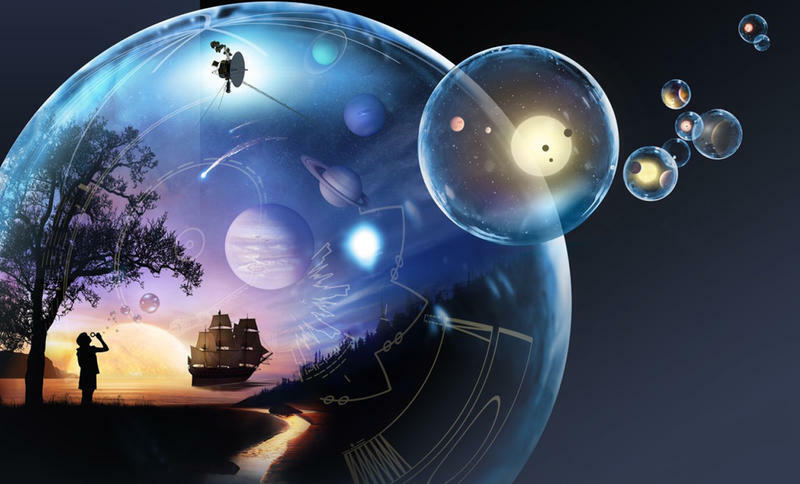 They were processed by citizen scientists David Marriott and Kevin Gill. Last month the space agency showed a similar oil painting-like image of the planet taken from just 11,700 miles (19,000 km) from the tops of Jupiter’s clouds — roughly the distance between New York City and Perth, Australia. Juno was positioned at a latitude of 57.57 degrees - nearly three-fifths of the way from the gas giant planet’s equator to its north pole. The colour-enhanced image, which shows a 15,000-mile (24,000 km) cloud system in Jupiter’s northern hemisphere, was taken during the craft's ninth flyby on October 24. 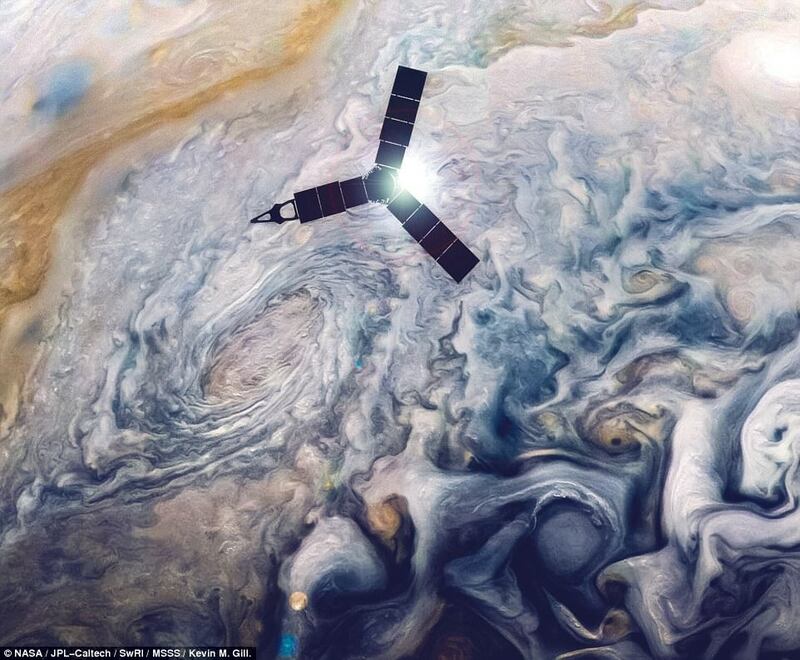 'Because of the Juno-Jupiter-sun angle when the spacecraft captured this image, the higher-altitude clouds can be seen casting shadows on their surroundings,' Nasa said in a statement at the time. In November, Nasa shared several other beautiful images of Jupiter taken during Juno's most recent flybys of the planet. One of the most breathtaking photos shows a 'string of pearls' – a series of eight massive rotating storms on Jupiter. The image, also taken on 24 October, was snapped when Juno was 20,577 miles (33,115 kilometres) above the tops of the clouds of the planet. It was processed and colour enhanced by citizen scientists Gerald Eichstadt and Sean Doran. A 'string of pearls' was pictured in the image at 40 degrees south latitude on the gas giant planet. Juno comes close to the surface of Jupiter for just a few hours once every 53 days. The probe can't take images through the duration of the flyby, and instead targets select regions during each close approach.